My older son is interested in spiders. So when he got to choose cupcakes to make for a bake sale he chose spiders. He knows exactly what a spider looks like so he knew what he was after. Our spiders needed to be anatomically correct! It was pretty easy to make our spider cupcakes. As usual my cupcakes were made with kids help so they're a little thrown together! It does make it fun though. Here's a couple of finished spider cupcakes. We made a batch of them for a bake sale. I'm sure we'll be making them again for Halloween. We went with white fondant this time, but orange fondant or candy melting wafers would work really well for Halloween. Take a good look at the spider anatomy if you want to get it right. You can arrange the legs as shown to get a pretty realistic spider shape. Yeah yuck. The things I do for my kids! First buy or make a batch of cupcakes. Ours were just plain, but chocolate cupcakes are always popular too. Add white fondant to the cupcakes. You could use prerolled fondant. I just made my own from confectioners sugar. Leave the cupcakes to set. You'll need to roll our four long tubes for the legs and arrange them as shown. Roll a ball for each of the body segments of the spider and pop them on top. 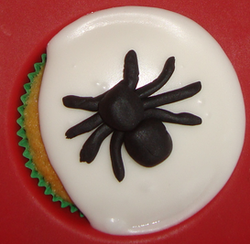 If you made your own fondant then pop the spider on to the cupcakes when the fondant is almost, but not quite, set. 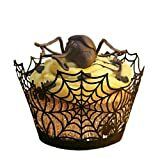 Spider cupcakes would look amazing in the spiderweb cupcake cases. 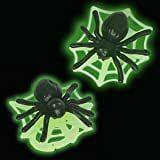 The glow in the dark spider cupcake toppers are a quick alternative to making fondant spiders and give the kids a favor to take home. Making spider cupcakes is a fun activity for kids. My five year old son decorated this spider cupcake himself. Decorating spider cupcakes would make a fun party activity at a nature or bug themed birthday party or a Halloween party. Kids love spiders, the love squishy fondant, and they love eating the resulting spider cupcakes. Halloween Party Supplies - Wooo! Do you need Halloween Party Supplies for a Halloween party? We've got some great Halloween tableware and matching decorations to make you party go with a woooo! Did you like the Spider Cupcakes? Cute idea! I know what you mean: "Oh, the things I do for my kids!"